My 22 year old son asked me to contact Care4Calais to volunteer with him for a weekend. I emailed them and explained that I had a weak right arm and wouldn’t be able to help much in the warehouse but that my son was strong and I had a 7 seater car and that was what I could offer: lifts. We spent the morning in the warehouse where I stacked little soaps and toothpastes into boxes then headed out to a refugee site near Calais. One of the first men in line put two fingers to his ear to indicate he was deaf and I suddenly realised I could use a skill here that I hadn’t even considered worth mentioning: that I can sign. 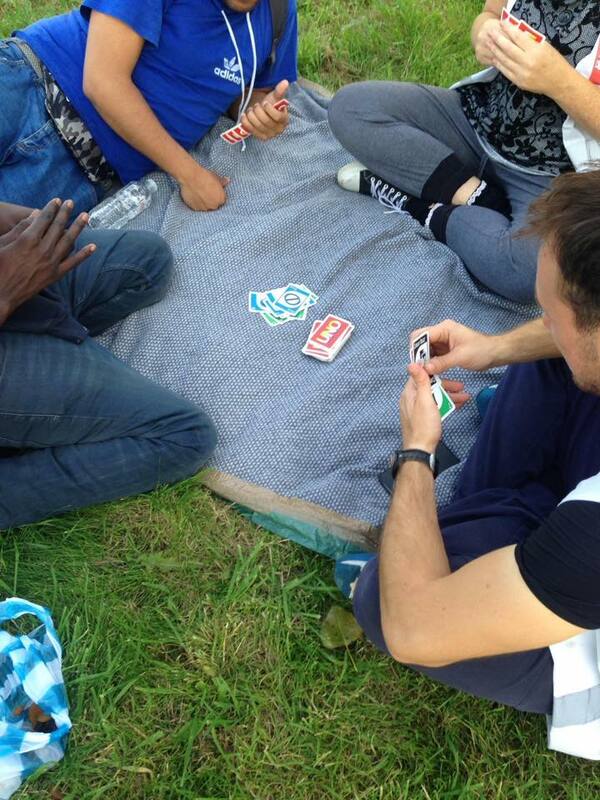 We sat on a blanket playing uno: the deaf guy and a group of his friends, and they fired questions at me. “What’s his name? How old is he? Where is he from? Does he have a girlfriend?” They had been friends for weeks, camping together, watching out for each other, sharing their stories, yet this man (boy, as it turns out – he signed that he was 16) hadn’t even been able to tell anyone his name. I can’t speak Arabic and he couldn’t speak English. I can’t sign African Sign Language and he couldn’t sign British Sign Language. The bridge we found was that we both knew a little broken American Sign Language and with that he was able to tell me, and his friends, that he wanted to go to England, to Birmingham, that he had a lovely deaf girlfriend, that he didn’t know anything about the asylum process, that he had been thrown off a bus when the driver realised he was deaf, that he had loved school as a child and wanted to be a wildlife photographer when he was older. A beaming smile never left his face. Care4Calais charged his phone for him, provided WiFi, and with the precious little phone credit he had available he FaceTimed his girlfriend. “Look!” he signed “Today I ate, yes, AND HAD A CONVERSATION!” He turned the phone towards me and I waved at the happy face of his worried girlfriend so far away. “Thank you” she signed. And waved back. Before we left the boy asked me to teach him the alphabet in British Sign Language. “When I get to England I need to be able to communicate.” So we slowly went through our ABCs, repeating and correcting until he had it down. I taught him to sign in British “I’m deaf. I’m 16. I want to claim asylum.” I hope he gets to use it. He taught me some African Sign Language too: the alphabet, “wildlife photographer”, “Sudan” and his sign name to indicate his tall hair. So this was my first day. I was worried about coming. I doubted what I had to offer: nearly 50 with a dodgy arm. If you are thinking that you can’t volunteer because you’re not sure what you have to give please remember that you never know until the day what hidden talents you may have that you didn’t even realise could be so so important in a refugee’s journey. The smallest thing can be life changing.